The Championship Tour - featuring nearly every artist for the Top Dawg Entertainment label! Why See Kendrick Lamar with SZA and Schoolboy Q? Get ready for a tour like no other! One that features nearly an entire recording labels roster of artists. Top Dawg Entertainment, the LA based recording company, has churned out some of the best hip-hop and R&B songs for more than five years, and now's your chance to see all their work on one stage. It's an event that's too good to miss! 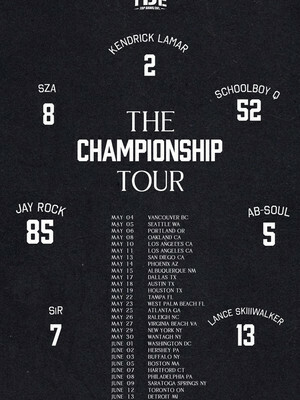 The Championship Tour will feature some of the greatest artists the label has to offer, including; Grammy Winner Kendrick Lamar, SZA, Schoolboy Q, Jay Rock, Ab-Soul, SiR, and Lance Skiiiwalker. Headlining the tour will be the incredible Kendrick Lamar (winner of Best Rap Album, Best Rap Song, Best Rap Performance and Best Rap Collaboration at the 2018 Grammy Awards) with tracks from several of his acclaimed albums. His recent album DAMN has become hugely popular, historically becoming the first work from non-classical or jazz artist to win the Pulitzer Prize. Top Dawg Entertainment currently features eight signees; the above and also rapper Isaiah Rashad - who hopefully will be joining them on this tour. 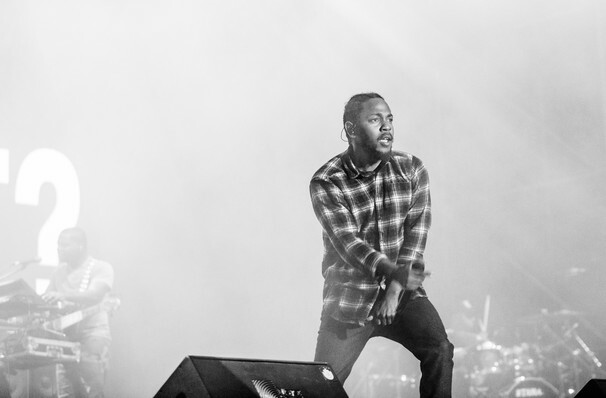 Seen Kendrick Lamar with SZA and Schoolboy Q? Loved it? Hated it? Sound good to you? Share this page on social media and let your friends know about Kendrick Lamar with SZA and Schoolboy Q at Lakewood Amphitheatre. Please note: The term Lakewood Amphitheatre and/or Kendrick Lamar with SZA and Schoolboy Q as well as all associated graphics, logos, and/or other trademarks, tradenames or copyrights are the property of the Lakewood Amphitheatre and/or Kendrick Lamar with SZA and Schoolboy Q and are used herein for factual descriptive purposes only. We are in no way associated with or authorized by the Lakewood Amphitheatre and/or Kendrick Lamar with SZA and Schoolboy Q and neither that entity nor any of its affiliates have licensed or endorsed us to sell tickets, goods and or services in conjunction with their events.